I am fond of Data Structures and Algorithms. Most of the data listed below is from my notes that was captured during my study of Data Structures. My major source of information on Data Structures is the book – ‘Data Structures Using C and C++ (2nd Edition) by Yedidyah Langsam, Moshe J. Augenstein, Aaron M. Tenenbaum’. You can find more information about the book in the References section at the end of this post. A Binary tree is a finite set of elements that are either empty or partitioned into three disjoint subsets. The first subset contains a single element called ‘Root’ of the tree. The other two subsets are themselves trees called ‘Left’ and ‘Right’ sub trees of the original tree. A ‘left’ or ‘right’ sub tree can be empty. Each circle is termed as a ‘Node’. Node labeled ‘A’ is called the ‘root’ Node. Node labeled ‘A’ is also called the ‘father’ of Node labeled ‘B’ and Node labeled ‘C’. Node labeled ‘B’ is termed as the ‘left son’ of Node labeled ‘A’. Node labeled ‘C’ is the right son of Node labeled ‘A’. Node ‘C’, ‘D’ and ‘E’ are called ‘leaf’ nodes since they have no children. Node ‘B’ and ‘C’ are brothers. Node ‘D’ and ‘E’ are the left descendants of ‘A’. Node ‘A’ is the ancestor of ‘D’ and ‘E’. Node ‘C’ can also be termed as the ‘right descendent’ of ‘A’. Every non-leaf node in a binary tree has non-empty left and right sub trees. 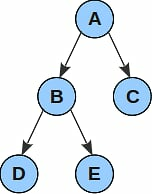 A strictly binary tree with ‘n’ leaves has ‘2n-1’ nodes. The root of a tree has level 0 and the level of any other node in the tree is one more than the level of its father. The depth of a tree is the maximum level of any leaf in the tree. This equals the length of the longest path from the ‘root’ node to any ‘leaf’ node. Pingback: Data Structures: Key points about a Binary Tree – Part 2 « Search for Knowledge!